To produce steam for industrial purposes besides producing electric power. The steam may be used for varying purposes in the industries such as textiles, food manufacture, paper mills, sugar mills and refineries. • A furnace to burn the fuel. • Steam generator or boiler containing water. Heat generated in the furnace is utilized to convert water into steam. • Main power unit such as an engine or turbine to use the heat energy of steam and perform work. • Piping system to convey steam and water. The general layout of the thermal power plant consists of mainly 4 circuits as shown in fig. This circuit consists of coal storage, ash storage, coal handling and ash handling systems. The handling system consists of belt conveyors, screw conveyors etc. Coal arrives at the storage yard and after necessary handling, passes on to the furnaces through the fuel feeding device. Ash resulting from combustion of coal collects at the back of the boiler and is removed to the ash storage yard through ash handling equipment. The Indian coal contains 30 to 40% of ash and a power plant of 100MW produces normally 20 to 25 tones of hot ash per hour. This circuit consists of air filter, air preheater, dust collector and chimney. Air is taken in from the atmosphere to the air preheater through the action of a forced or induced draught fan or by using both. The dust from the air is removed by means of using air filter before supplying to the combustion chamber. The exhaust gases carrying sufficient quantity of heat and ash are passed through air preheater where the exhaust heat of the gases is given to the air and then it is passed through dust collectors where most of the dust is removed before exhausting the gases to the atmosphere through chimney. This circuit consists of boiler feed pump, boiler, turbine and feed heaters. The steam generated in the boiler is fed to the steam prime mover to develop the power. The steam coming out of prime mover is condensed in the condenser and then fed to the boiler with the help of pump. The condensate is heated in the feed heaters using the steam tapped from different points of the turbine. The feed heaters may be of mixed type or indirect heating type. Some of the steam and water is lost passing through different components of the system, therefore, feed water is supplied from external source to compensate this loss. The feed water supplied from external source is passed through the purifying plant to reduce the dissolved salts to an acceptable level. The purification is necessary to avoid the scaling of the boiler tubes. This circuit consists of circulating water pump, cooling water pumps and cooling tower. The quantity of cooling water required to condense the steam is considerably large and it is taken from lake, sea or river. The cooling water is taken from the upper side of the river, it is passed through the condenser and heated water is discharged to the lower side of the river. Such system of cooling water supply is possible if adequate cooling water is available through the year. This system is known as open system. When the adequate water is not available, then the water coming out from the condenser is cooled either in cooling pond or cooling tower. The cooling is effected by partly evaporating the water. This evaporative loss (this includes evaporation and carryover) is nearly 2 to 5 % of the cooling water circulated in the system. To compensate the evaporative loss, the water from the river is continuously supplied. When the cooling water coming out of the condenser is cooled again and supplied to the condenser, then the system is known as closed system. When the water coming out from the condenser is discharged to river downward side directly, the system is known as open system. Open system is economical than closed system provided adequate water is available throughout the year. Steam is generated in the boiler of the thermal power plant using the heat of the fuel burned in the combustion chamber. The steam generated is passed through steam turbine where part of its thermal energy is converted into mechanical energy, which is further used for generating electric power. 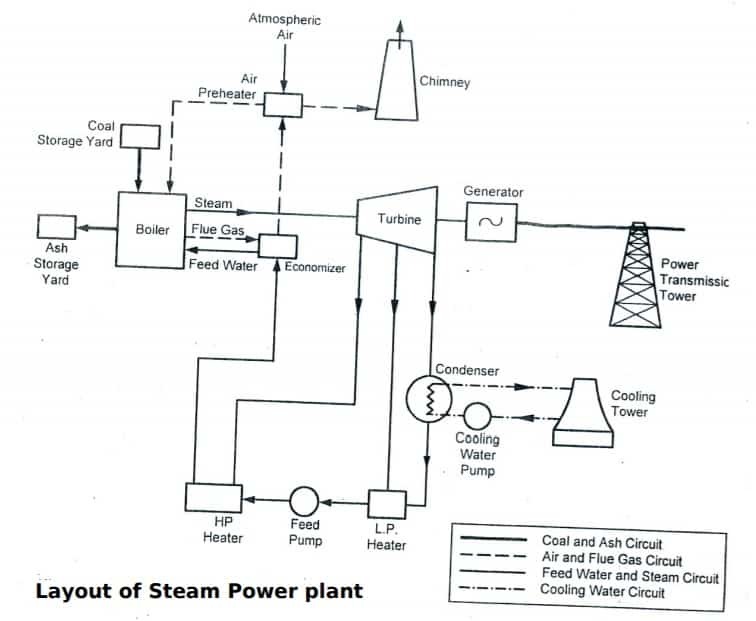 The steam coming out of the steam turbine is condensed in the condenser and the condensate is supplied back to the boiler with the help of the feed pump and the cycle is repeated. The function of the boiler is to generate the steam. The function of condenser is to condensate the steam coming pout of steam turbine at low pressure. The function of the steam turbine is to convert part of heat energy of steam into mechanical energy. The function of the pump is to raise the pressure of the condensate from the condenser pressure (0.015 bar) to boiler pressure (200 bar). The other components like economiser, superheater and steam feed heaters (steam from different points of turbine is fed to the heaters to heat the condensate to a higher temperature) are used in the primary circuit to increase the overall efficiency of the thermal power plant. 2. The power plant may be located near the load centre, so that the cost of transmission and the losses due to transmission are considerably reduced. 3. The quantity of water in hydroelectric plant depends on nature, such as rain and rivers. This is not so in the case of thermal power plants. 4. The construction and commissioning of thermal power plant takes lesser period when compared to hydro electric power plant. 1. The fuel (coal or oil) used in thermal power plant will one day get exhausted since it is a non renewable source of energy that is used. 2. It cannot be used as peak load plant, as its part load efficiency decreases very rapidly with decreasing load. 3. The transportation of fuel is a major problem for power plants located away from coal fields. 4. The cost of power generation is considerably high compared to hydroelectric power plant. 5. The smoke produced by the burning fuel when exhausted into the atmosphere causes air pollution. 6. The life of thermal power plant according to the Electricity supply act is 25 years and that of hydroelectric plant is 35 years. The efficiency decreases to less than 10% after its life period. Hydroelectric powerplant can have a life of even 100 to 125 years. 7. The turbines in thermal power plants run at a speed of 3000 to 4000 rpm and they require special material and rigid construction as compared to hydro electric plant which has a low running speed of 300 to 400 rpm.